There is a culture war going on in American between the secular progressives and traditionalist warriors. 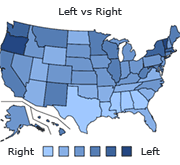 This quiz will give you a clue as to where you stand in the culture wars. Are you a traditionalist warrior or are you a socialist progressive? Not sure? This short quiz will give you an idea to which camp you belong or are you somewhere in between? Do you believe in "income redistribution"--that is, the government taxing affluent Americans at a higher proportional rate in order to fund entitlements to the less well off? Do you believe the definition of marriage should include homosexuals? Do you think suspected terrorists captured overseas are entitled to Geneva Convention protections-that is, the same rights that military people are afforded? Do you believe that the USA, in general, is harmful to the world? Are you against states legally mandating that parents be informed when their underage daughters have abortions? Do you support removing "Under God" from the Pledge of Allegiance? America would do better if we were more socially progressive like Europe. In public schools,do you believe that Christmas should be taken out and condoms given out freely? Is America the reason for radical Islamic terrorism? Do you believe dangerous consequences are likely to come from cultural sensitivity--such as the fact that U.S. guards at Gitmo hand the detainees the Koran wearing gloves because they regard infidels as "unclean"? Quiz topic: Am I A Secular Progressive or a Traditionalist?